Scott is back from Jackson, Wyoming and shares his experience with Amy on the Queercast. He saw fancy pants Bisons (wait for the impression), Moose, went through Yellowstone and explained whether it was okay to be gay there. Amy also wants to know if GBLT folks are obsessed with their pets? What do you do with your pets when you travel? Music Featured on This Queercast: Lianne La Havas - "Is Your Love Big Enough?" 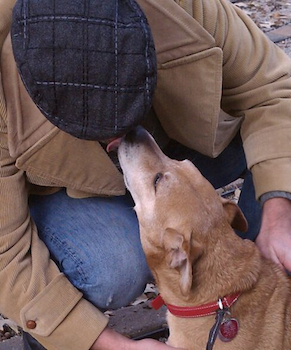 and Ben Taylor - "Worlds Are Made of Paper"
Photo Credit: Scott's little man, Buster giving kisses.